I started using the Ryobi 24-Volt Cordless Stick Edger (model RY24310) this year and I've been completely blown away by how well it works and decided it's about time I posted my review here. I've used it practically every time I've mowed and it has become one of my favorite lawn power tools. This came as a big surprise to me as I really expected it to be horrible. With only a 24V battery I didn't expect much from it. Boy was I wrong! I received the RY24310 from Home Depot in order to provide feedback on it. If it wasn't for that, I never would have even thought to buy it thinking it wouldn't be that good. I just didn't think it would have enough power to do as good a job as the Black & Decker LE750 Edge Hog corded electric edger I've been using. To be fair... It's not as powerful but it is powerful enough that I haven't used the LE750 at all this year. Understanding the power limitations of it helps. I have some tips for using it to get the most out of your RY24310 edger. Not having to uncoil, drag around and coil a long extension cord has been just great! I used to only edge my lawn once, maybe twice a month because I didn't look forward to the hassle of dealing with the extension cord. 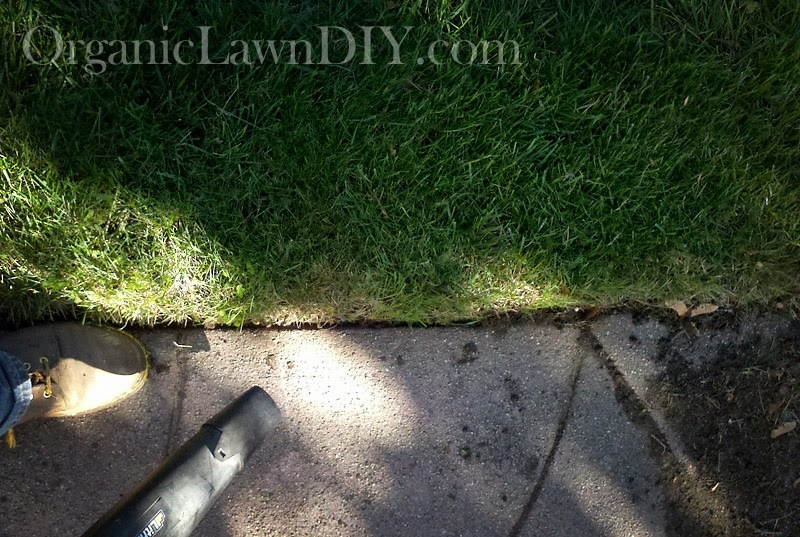 In between edging, I used to touch up the edge with my string trimmer but string trimmers don't edge as well as edgers. Now I just use the Ryobi Cordless Edger all the time. This isn't a toy. It's a tool that has a partly exposed metal blade spinning around at high speeds. Think of it like a mini lawn mower on it's side. Make sure you read and follow all the safety guidelines in the manual. Rocks and debris can fly pretty far and fast so make sure nothing you don't want dirt and rocks flying at is in it's path, wear safety glasses and keep yourself and others away from the spinning blade. Like I said, I honestly thought I was going to try this out, see it wasn't good and then it would just collect dust. When I first tried to use it, I followed the instructions to assemble it (which were easy), charged the battery, placed the wheel on the concrete walk, made sure the blade was at the edge and pulled the trigger. Nothing happened! I could hear the motor struggling but the blade just wasn't spinning. I checked the battery, checked the moisture of the soil (edgers work best when the soil isn't too wet), checked to make sure I wasn't on the concrete walk and everything looked fine. Before throwing it in a corner and patting myself on the back for being right about it not working I decided to figure out what was going wrong. It's only a 24V battery trying to carve a small trench into soil. The motor doesn't seem to have a lot of torque. Especially starting torque. The solution seemed simple. Start the edger before the blade is in the soil. I tilted the edger back on its one wheel so the blade could start spinning freely, pulled the trigger, then slowly tilted it back down into the soil. Voila! It worked. Once the blade is spinning it keeps going and I was able to walk forward and edge the lawn. It might bog down a bit through some difficult portions but just slow down if you start hearing the motor struggle. A small back and forth motion through those areas works too. Since it's a battery-powered tool the motor isn't that powerful. At least when comparing to traditional gas powered edgers. As I found out it can get overworked so it's best to not try to edge at full depth all at once. The Ryobi 24V Cordless edger has 4 depth settings that are easy to change by moving a lever. 1 is the deepest and 4 is the shallowest. The depth lever moves the wheel up or down which in turn adjusts the blade height in relation to the ground. 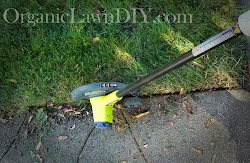 The first time I tried to use the Ryobi stick edger was the first time my lawn was being edged that season. The previous fall was when I did my organic lawn renovation which left my edge a mess. There was soil and grass spilling over the edge. I was planning to edge it last year but I didn't get a chance to before the Hurricane hit and then winter came. I started out edging on the shallowest depth setting (4) then followed up with a second pass on the next shallowest setting (3). Even after the first pass the edge looked fine but I like the look of a deeper edge. Since I use this every time I mow I switched to 2 the next week and 1 the week after that. I've since been edging at mainly the deepest setting with no issues provided I wait at least a day after it rains to use the edger. If it rains heavy or I missed edging for a week or two I might back down to 2 or 3 for depth. I have less than 200' of lawn edge against hard surfaces. The first time I used the edger I had to cut through a very overgrown edge in two passes. Some areas were very slow going as I had to move the edger back and forth to cut through the heavy growth. There was one small 3-4' section I couldn't get through at all. By the end the battery was completely drained. Since then, edging has gone a lot smoother and I was able to take down that over grown section I had a problem with the first time. I only need one pass now and based on the battery life indicator on the battery I only use about 1/4 of the battery power. The lithium ion battery charges fast in the provided battery charger. If I forget to charge the battery I can throw it in the charger, mow the lawn and the battery will have enough charge to edge by the time I'm done mowing. Though that does mess up the traditional edge, mow, trim and blow order. As long as trimming comes after mowing and blowing is the last step it all works out. Using a blower has another benefit. It blows the loose dirt that fell back into the edge out, leaving the edge more defined which looks better in my opinion. In the picture I'm using the Ryobi Cordless Blower to clean up the walks and edge. The blower came with a 40V battery. I thought I'd be able to use it on the edger, since it says it can use 24V or 40V batteries. Unfortunately the RY40410's 40V battery doesn't fit in the RY24310 edger. The edger is actually an attachment on the 24V/40V power head. You can remove the edger and attach other tools such as a long reach pole saw and a long-handled hedge trimmer. If you don't expect the power of a gas-powered stick edger and treat it accordingly, the RY24310 works great. Take it slow and make sure you don't try to edge when the soil is too wet. It just makes a mess and clogs up the blade shroud preventing the blade from spinning freely. If your lawn hasn't been edged in a while start out with a shallow setting and work your way down ver time. I really wish I could have used the 40v battery that came with my blower on it and I liked having the metal blade guard that my corded Edge Hog has. It helps guide the edger against the edge of the walk while minimizing any contact the blade has with the concrete. So far I've been careful and haven't noticed any damage to the walks and the blade doesn't seem to be wearing away too fast. I haven't felt the need to drag out my corded edger at all and because it's easier to set up (just push in the battery) I edge every time I mow which gives the lawn a neater appearance. The lawn care companies that do my neighbor's lawns edge every tie they come out and now so do I! 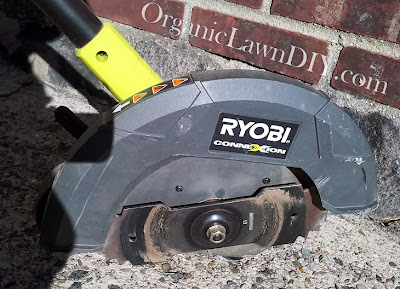 It took me by complete surprise that I would like the Ryobi Cordless Edger as much as I do. It is available from Home Depot. Looks like this product has been discontinued. Are there any good battery-powered alternatives? Hi, thanks for letting me know. Looks like Ryobi came out with a new model Ryobi P2310 ONE+ 9 in. 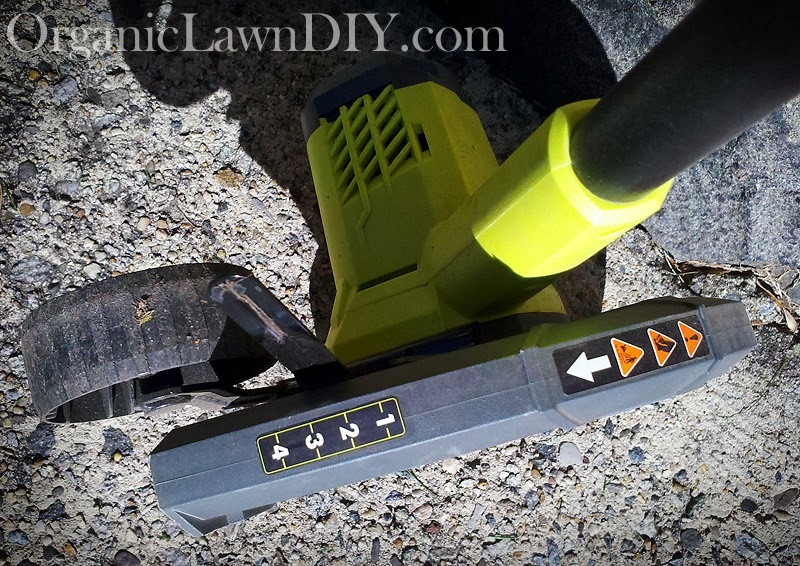 18-Volt Lithium-Ion Cordless Edger. Looks pretty good and I like that they're using the One+ battery so it's compatible with other tools you may already own.